Cristiano Ronaldo retained his FIFA men’s player of the year crown on Monday night, beating Lionel Messi and Neymar to earn the accolade of the world’s best footballer. The Real Madrid star picked up the award ahead of his rivals from Barcelona and Paris Saint-Germain on the back of triumphs in La Liga and the Champions League last season. Ronaldo has scored 44 goals for club and country so far in 2017 and scored twice in the Champions League final in June as Real retained the trophy and became European champions for a record-extending 12th time. The Real Madrid star was presented the award by Diego Maradona and his Brazilian namesake at Monday’s ceremony, which took place at the London Palladium. It was the second since the FIFA award once again split from the Ballon d’Or prize. Messi has hit 50 goals for Barca and Argentina while Neymar, who became the world’s most expensive player when he left Barcelona for PSG in £198million in the summer, has 25 goals to his name for club and country. 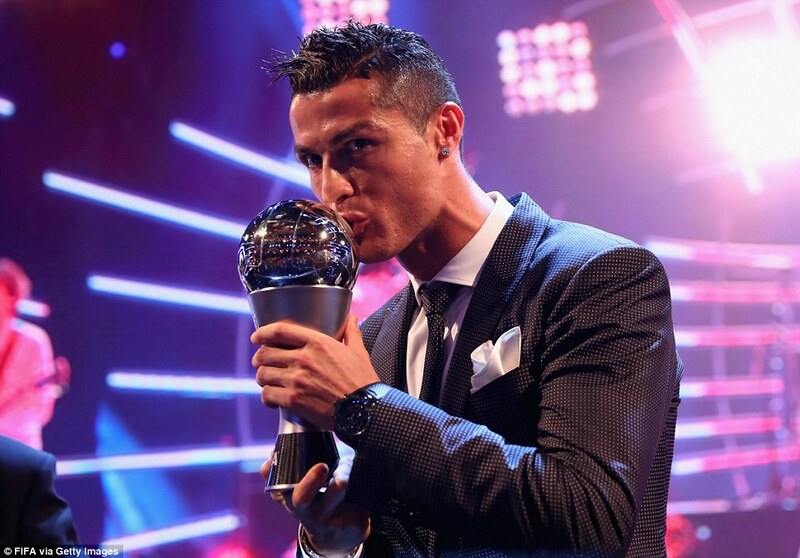 But with his team silverware outshining those of his two rivals, Ronaldo was the heavy favourite to win the award for a second year running. Earlier in the evening, Olivier Giroud picked up the Puskas Award for best goal after his stunning scorpion kick for Arsenal against Crystal Palace, while Zinedine Zidane was male named coach of the year. Ronaldo, Neymar and Messi were all also named in the FIFPro World XI alongside the likes of Juventus goalkeeper Gianluigi Buffon, Alves and Sergio Ramos. Toni Kroos and Luka Modric ensured there were five Madrid players in the XI, with two from Barcelona and none from England or the Premier League. Buffon also picked up the gong for the best goalkeeper of the year after helping Juventus secure a sixth consecutive Serie A scalp and a place in the Champions League final, while Holland’s Lieke Martens won the FIFA women’s player of the year award. The other awards went to Francis Kone (fair play), Celtic (fans) and Sarina Wiegman (women’s coach).